Greaser hairstyles, known as “rockabilly hair men” are one of the symbols of the fashion era of the 50’s. 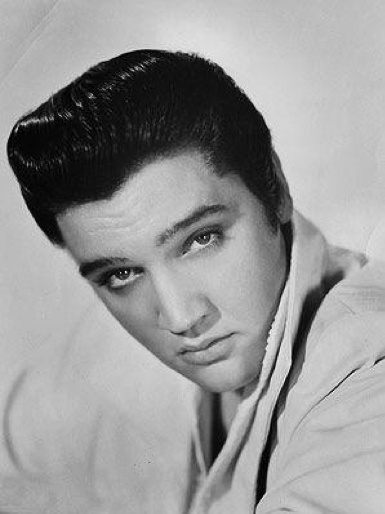 It was a remarkable hairstyle of fashion icons – Elvis Presley, Marlon Brando, Johnny Cash. Men’s fashion repeats and this year, more and more hairstylists are inspired by a rebellious lifestyle and they invent new, modern twists of the greaser hairstyles, and those men who choose them, easily make a statement wearing this dope haircut. The point is to use a lot of hair styling product in order to reach wet and smooth effect. Greaser hairstyles incorporate rockabilly hair men, a jelly roll hairstyle, slicked back hair, comb-over, a conservative or modern quiff, an undercut, a classic pompadour, etc. 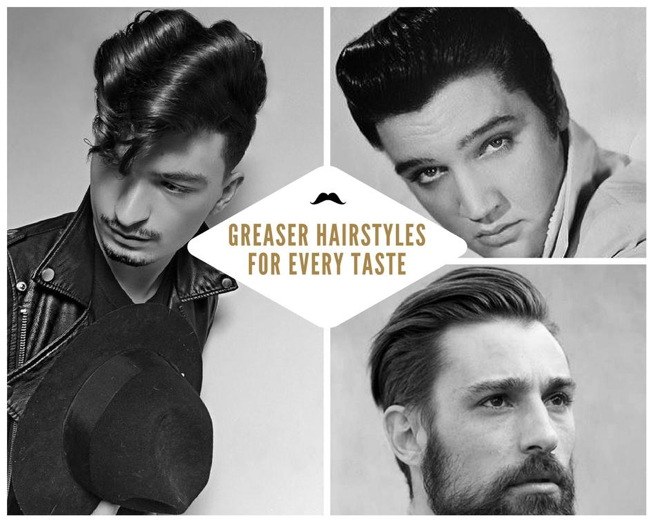 Here is a compilation of greaser hairstyles for every taste. Choose any of them and be in the spotlight! Inspired by rock and roll, this hairstyle looks modern and sophisticated. 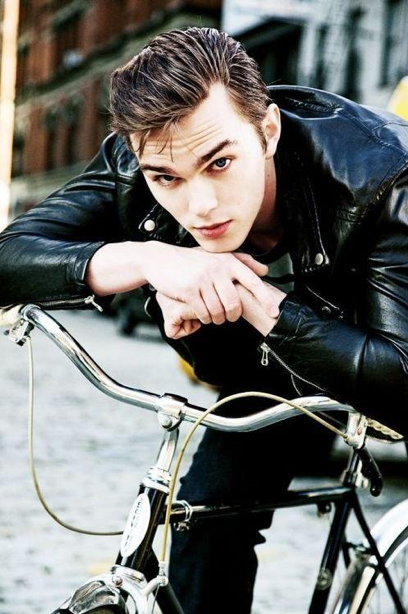 Greasers of the 50s and 60s got their signature look by using pomades, and that’s what you’ll need to use, too. 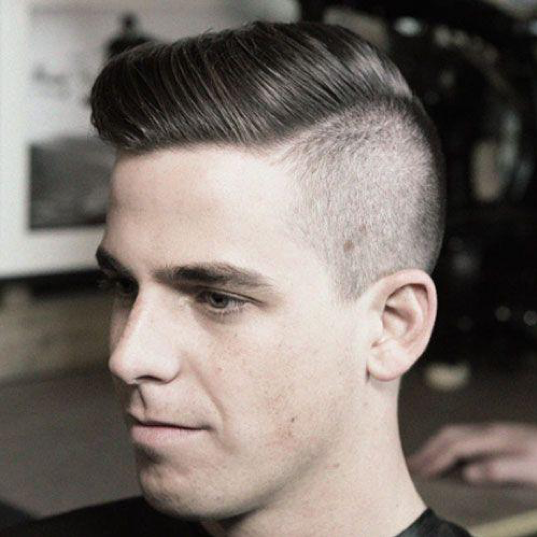 You can have your sides tapered, the crown should be left long enough to create a pompadour. The crown should be styled by a professional to achieve a polished look, however, if you are up to a more casual style, you can do it yourself. Apply pomade on hair, curl your hair inward and leave your ends curled, then fix with a hair spray. With this stylish look, you’ll feel self-confident. Slicked back hair is eternal classics. It looks fantastic and requires low-maintenance. 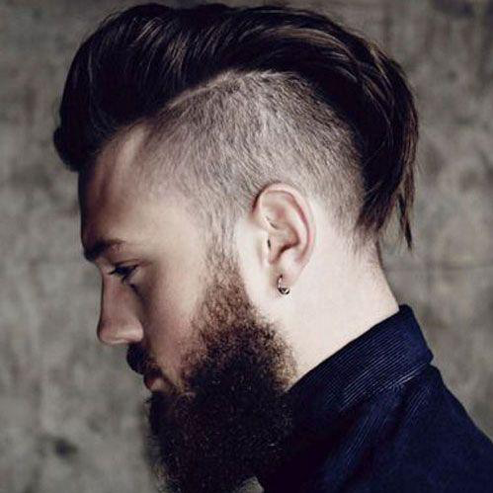 If you want to achieve a more rebellious look, you can combine this hairstyle with a beard. Comb the hair from the sides and the top to the back so that it meets the middle of the back. Then, apply pomade or gel to plaster the hair to the head. If you want, you can bring a variation to this hairstyle and tease the crown a little bit to make it more volumetric. If you like Elvis Presley’s hairstyle and you have dense hair, then a greaser pompadour hairstyle is your ultimate choice. It looks very stylish and fits all face shapes. The styling is easy and you can do it yourself. Apply pomade or gel, comb your crown forward and sideways, flip your hair back to give it a lift. Your sides can be faded or just trimmed. It is up to you whether to do this hairstyle with a parting or without it. Apply pomade if you need a soft hold or gel if you need a stiff hold. If you don’t want to pull off a completely vintage look, you can go for a side quiff with short sides. Men with curly hair will absolutely love this hairstyle because all they should do is to embrace their natural texture and give a more defined shape to it with the help of wax, pomade, and a hairspray. Make sure the quiff is voluminous and fix it with a hair spray. If you are a daring man with a rebellious spirit, you can choose a modern variation of a classic hairstyle – a comb-over haircut. 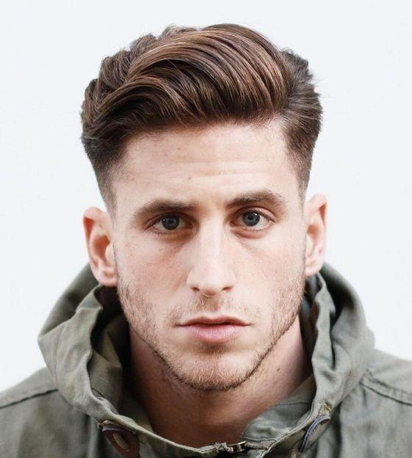 This hairstyle is perfect for men with sparse hair or for those, who don’t have much time for styling. 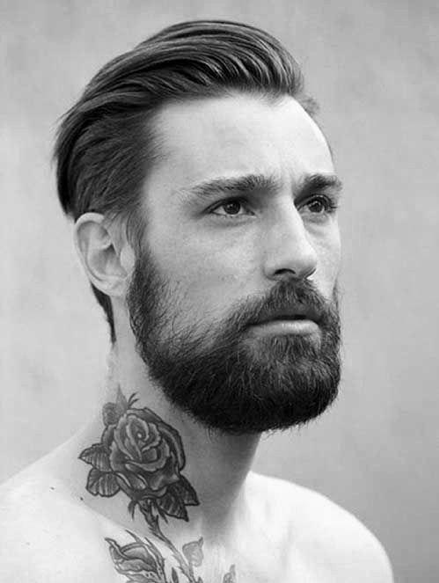 On top of that, this hairstyle can be rocked by gents within any age group, which is an undoubted plus. Just have your sides shaved, apply gel or pomade to the top to keep hair in place and off your face, then comb your crown back to the right and fix with a hair spray if needed. If your personal style is inherently modern, then these attractive spikes are what you need! 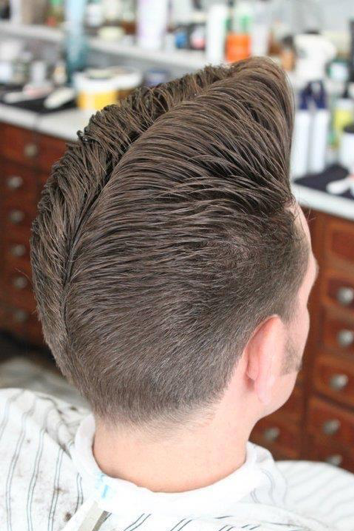 This rockabilly hair men looks appealing if you apply wax or pomade, then push your hair back with your fingers and fix with a setting spray. If you spend five minutes, you will get an attractive messy look. This hairstyle always looks appealing and it doesn’t matter whether you wear jeans or classic pants. Even if you have sparse hair, don’t worry! This hairstyle shows how to turn your flaws into virtues. Have your sides tapered or if you leave them long, comb them backward. Apply gel or wax, leave the back of the top messy, but make sure that your hair at the top is brushed upwards. Fix everything with a hair spray. If you strive for a rougher look, then combine this hairstyle with a beard. 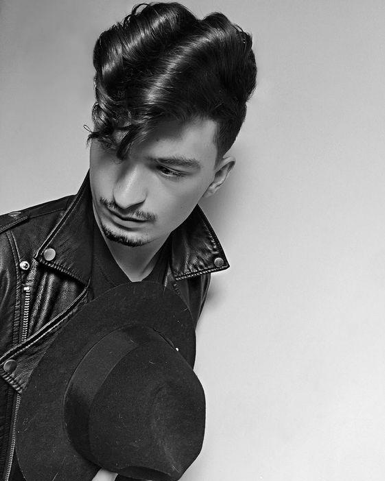 If you like contrasts, texture, and volumetric strands, then choose this rockabilly hairstyle. This classic haircut can also look fresh and modern. If you have curly hair, just embrace its texture, but if your locks are flat, make sure they are curled. Apply get/wax/pomade, comb your hair upward and then comb forward, preserving the necessary volume and texture. 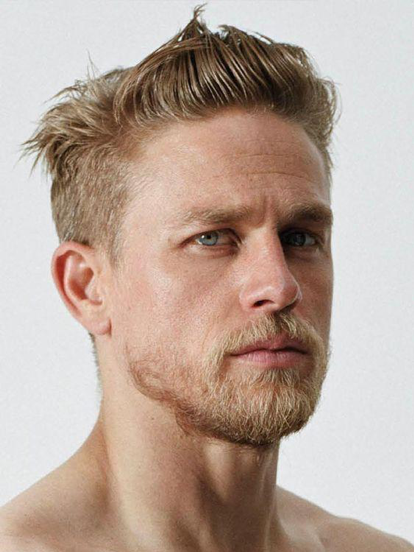 Your curly ends can cover the forehead (it’s especially great for men with a prominent forehead). You can have your sides clipped and a side part will create the necessary contrast. It is up to you whether you’ll make it dramatic or not. If you want to enhance the haircut, you can add various colors – blonde and brown tones will work great together. This rock and roll hairstyle has made a comeback. Leave your top long and pair it with an undercut. With long hair, you have almost limitless options: you can tie it back, create a top knot or apply pomade and comb backward. Add a beard and accessories to enhance your look, and you’ll be ready to rock the world! Thus, choose any of these stunning hairstyles to express yourself and emphasize your appeal.